Take a break from New Delhi with a short trip to Cyber Hub in Gurugram (Gurgaon), about 36 minutes away. On the 17th (Fri), spend a fun day on foot with Walking tours. Spend the 18th (Sat) on the rails with a train tour. 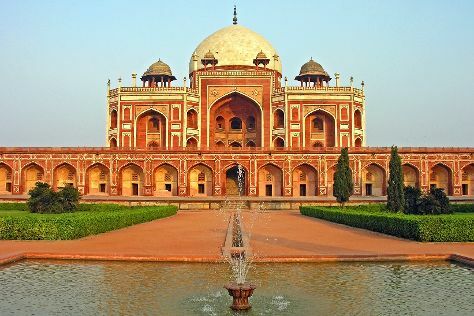 There's lots more to do: admire the natural beauty at Humayun's Tomb, steep yourself in history at India Gate, take in the spiritual surroundings of Lotus Temple, and admire the landmark architecture of Friday Mosque (Jama Masjid). To find other places to visit, more things to do, and more tourist information, use the New Delhi road trip planning website . Agra to New Delhi is an approximately 3-hour car ride. You can also take a train; or take a bus. In May in New Delhi, expect temperatures between 47°C during the day and 30°C at night. Cap off your sightseeing on the 18th (Sat) early enough to travel to Raipur. The administrative capital of Chhattisgarh state, scorching hot Raipur offers more in the way of government and business buildings than tourist attractions. Explore the numerous day-trip ideas around Raipur: Jagannath Mandir (in Bhilai) and Durg (Pasharwanath Tirth, Shiv Mandir, & more). Next up on the itinerary: take in the spiritual surroundings of Hatkeshwar Mahadev Temple, buy something for everyone on your list at Ambuja City Center Mall, don't miss a visit to Kevalya Dham Jain Temple, and admire the majestic nature at Naya Raipur Central Park. To find photos, reviews, other places to visit, and tourist information, use the Raipur trip builder website . The Route module can help you plan travel from New Delhi to Raipur. Finish your sightseeing early on the 24th (Fri) so you can travel back home.